For a number of years now we have been searching to bring you the right saddle chair, with seat tilt functionality and long term sitting comfort, all at the right price. We've done it! 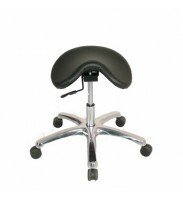 Exclusive to us here at Healthezone is this great new saddle seat or chair. Available in a choice of three PVC colours, black, dark navy and chocolate, the chair has super modern styling with a satin.. The WERK NXR-2 drafting stool features a moulded polyurethane drafting seat and back. This maybe the perfect seating solution for your office environment. Complete with pneumatic seat height adjustment and back height adjustment, its 18" chrome height adjustable footring and heavy duty nylon base with twin wheel casters, means it's made to last. This chair does not come with arm rests. .. Drafting chairs are great for all types of office and workplace environments: architects, designers, retail applications, server rooms and more. 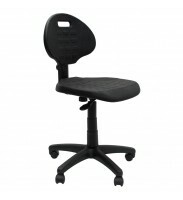 This new WERK RX-2 drafting stool and chair from Bad Backs offers great ergonomics at a great price. 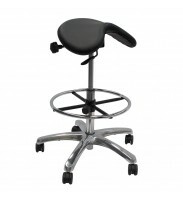 Featuring a gas lift height adjustable seat, chrome base and foot-ring. No arm rests included. Features rolling casters as standard, but glides.. The WERK sit stand stool is perfect for all drafting or sit stand environments. Water and stain resistant, the polyurethane construction of this great drafting stool makes it ideal for static sensitive areas. The chair seat is durable, yet comfortable for long terms sitting. 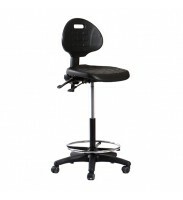 Includes both castors and glides for multiple use applications Features: Gas cylinder height adjustme..
A simple round stool with a firm molded PU black seat. Easy to wipedown and clean. Hard wearing, it's perfect for any industrial, production, laboratory or workplace settings. No hidden seams for dirt and dust to collect. Water and static resistant. 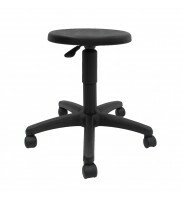 The BX stool features a height-adjustable seat, with a single lever mechanism for easy adjustment. The seat swivels 360 degrees. 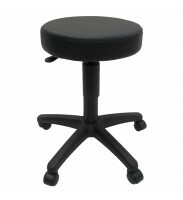 Comes wi..
A simple round stool with a padded seat upholstered in black PVC. Easy to wipedown and clean, it's perfect for any industrial, production, laboratory or workplace settings. 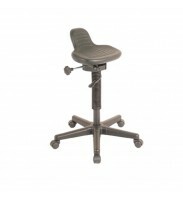 The CX stool features a height-adjustable seat, with a single lever mechanism for easy adjustment. The seat swivels 360 degrees. Comes with casters, and glides are available as an optional extra if required. Features..
A new version of our classic saddle chair, the EXR has a higher gas lift for a higher sitting position and includes a footring should you need it. It also includes both casters and glides so you can choose whether you prefer a fixed chair position or a rolling chair. Available in a black PVC finish, the chair has super modern styling with a satin star base and cylinder, and an ergonomically.. The Werk NX PU chair features a moulded polyurethane seat and back. A perfect seating solution for your industrial, workplace or office environment. Complete with pneumatic seat height adjustment and back height adjustment, its a great ergonomic choice for your workplace. This chair does not come with arm rests. The polyurethane construction makes the chair water and stain resistant, id..